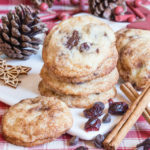 Chocolate chip and cranberry snickerdoodle biscuits are a delicious riff on the cinnamon dusted American cookie classic. 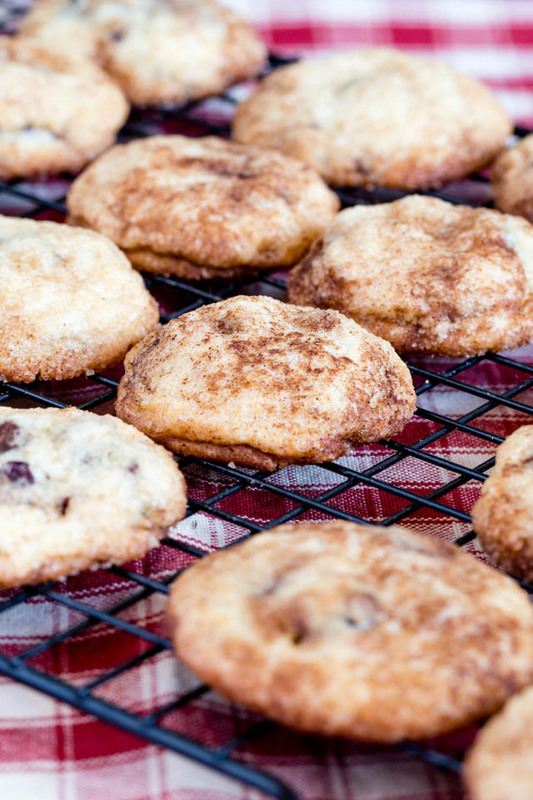 These Christmas Snickerdoodles are an easy bake perfect for the holidays. 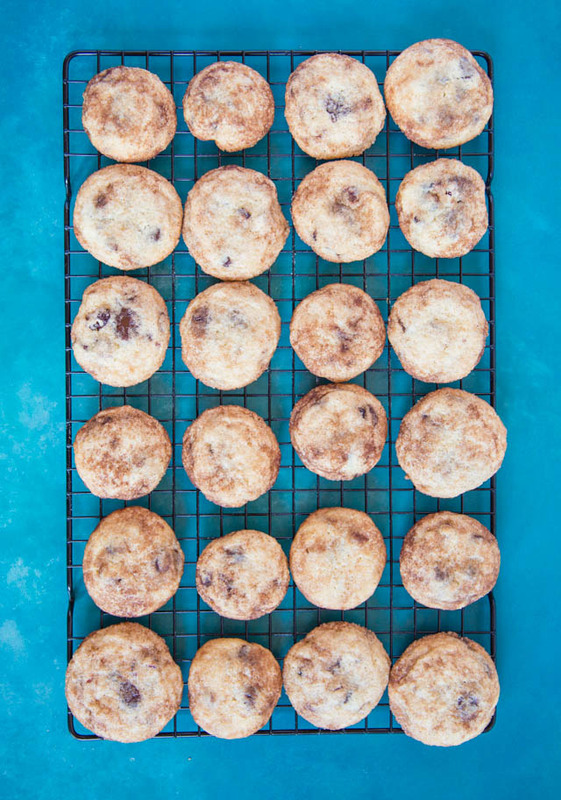 Just the name of these biscuits made me want to bake them: who on earth could resist a plate of snickerdoodles? A bit of research tells me that there’s some dispute as to the origin of the name, but the biscuit itself is very well defined: a straightforward sweet biscuit that’s coated in sugar and cinnamon powder before baking. What’s the difference between a biscuit and a cookie? The word biscuit is derived from Latin (bis – twice and coctus, cooked), via old French (bescuit). The cooking method was that they were first baked, then toasted in a cooler oven to harden them into something much less inviting than these treats. Cookies are so called from the Dutch koekje, meaning little cake. It’s generally thought that early Dutch settlement in the US was the origin of their usage – remember that New York was once called New Amsterdam? To make it confusing, biscuits in the US are much like the UK scones: a leavened soft cake. Finally just to really confuse, some UK biscuits are called cookies: chocolate chip cookies being the most common. I have an ancient gas oven and for years didn’t make cookies and biscuits as they would always end up burnt on the base, thanks to the vagaries of uneven heating in my oven. There are all sorts of specialist extra thick, or double layered baking trays you can buy to stop your cookies getting burnt on the bottom. It turns out that the way to prevent burnt cookie bases is really quick, easy and does not require any special equipment. Simply put another baking tray, or roasting tin on the bottom of the oven! Perfect cookies and no more biscuits with burnt bottoms! 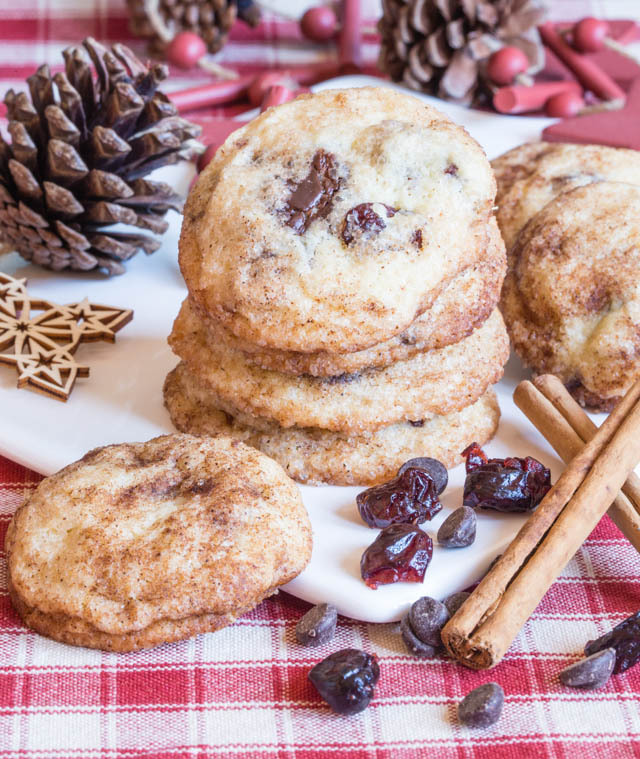 We’ve taken the basic biscuit and added an extra Christmas twist, with dried cranberries and chocolate chips. What could be better at this time of year? Perfect for sharing, a Christmas cookie swap, or even better, keeping to yourself. They’re also really easy to make. Cream together butter and sugar, then add the rest of the biscuit ingredients, roll into balls and bingo you have these delicious Cranberry and Chocolate Christmas Snickerdoodles. 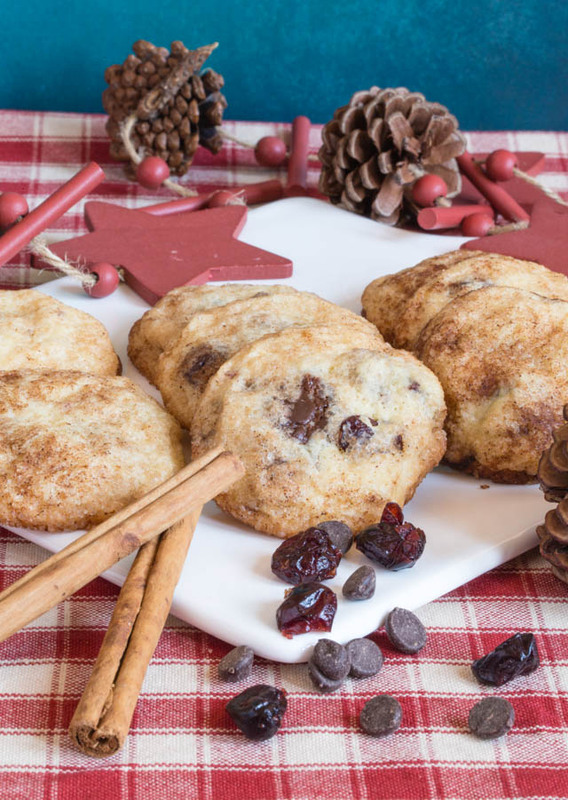 If you try this Chocolate Chip & Cranberry Snickerdoodle Biscuits – A Festive Twist on an American Classic please tag #FussFreeFlavours on Instagram or Twitter. It is amazing for me when for me when you make one of my recipes and I really do love to see them. You can also share it on my Facebook page. Please pin this recipe to Pinterest too! Thanks for reading Fuss Free Flavours! These sweet biscuits are easy to make and delicious. Chocolate and cranberries add to the Christmas flavour of the cinnamon and sugar dusting. Heat oven to 180°C (Fan oven)/Gas mark 6. Cream together the sugar and butter: this is easiest to do with an electric hand mixer. Add the egg and mix together. 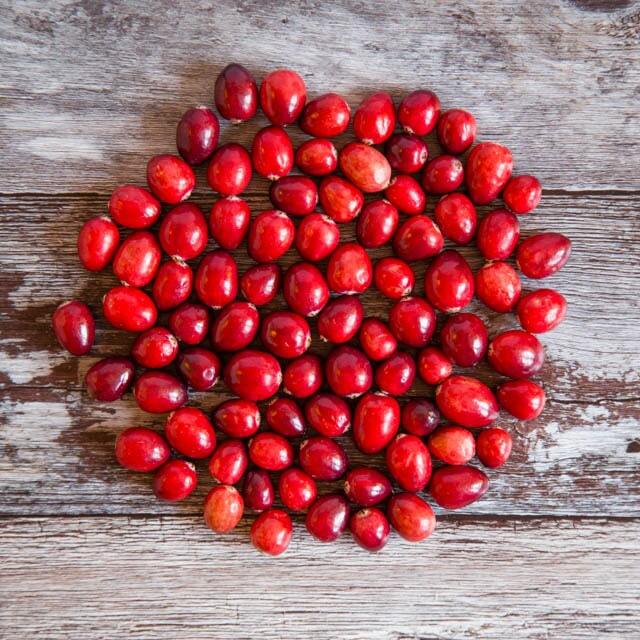 Chop the cranberries so that they're each cut into about quarters. Add the flour, baking powder, salt, cranberries and chocolate chips. Mix all together until well combined. Mix the rolling mixture of sugar and cinnamon on a dinner plate. Shape balls of dough about 2.5-3 cm in diameter. Roll in the cinnamon and sugar mixture. Place the balls on a silicon mat on a baking sheet, about 10cm/4 inches apart. Bake for 8-10 minutes. Remove from the oven and allow to cool for a few minutes before transferring to a wire cooling rack.